Residents in Lahore, Pakistan, gather on Tuesday in the aftermath of a bomb attack on a market. Islamabad, Pakistan (CNN) -- A blast hit near a building housing Pakistan's intelligence service, ISI, in the eastern city of Multan on Tuesday, killing at least 12 people and wounding 20 others, police said. The explosion took place at a security checkpoint, said Jamshed Akram of the city police. Four soldiers and four children were among the dead, said Dr. Kaleem Ullah of Multan's emergency services. Pakistan has blamed the violence on Islamic militants who have vowed to avenge a intense military offensive to rout them from their haven along the country's border with Afghanistan. The nation has come under increasingly frequent attacks. 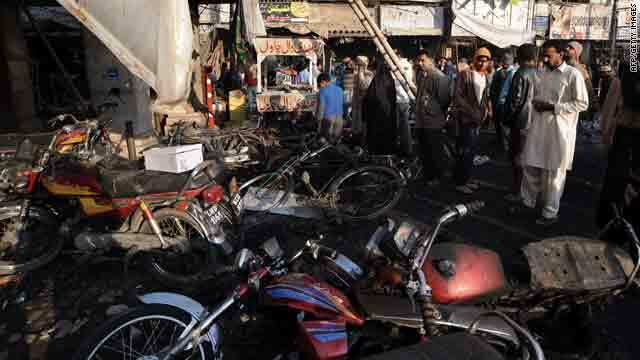 On Monday, a blast at a crowded market in Lahore killed 54 and wounded more than 150 people. The same day two other bombing attacks -- in Peshawar and Quetta -- killed at least 11 and wounded at least 41. The attacks came three days after militants armed with guns and grenades stormed a mosque in Rawalpindi frequented by military personnel. At least 36 were killed and 75 wounded. The Pakistani Taliban claimed responsibility for the mosque bombing, but there were no immediately claims for Monday's attacks. In an e-mail to CNN about the mosque attack, the Tehrik-i-Taliban Pakistan said: "We reconfirmed it, that the TTP has done it, and will do more which are already planned. We once again mention that we are not against the innocent people and the state of Pakistan but against those officers and ministers who are American by hearts and minds and Pakistani just by faces." The United States has pressed Pakistan to rout out Taliban militants. Fighting the war in Afghanistan is "inextricably linked to our partnership with Pakistan," President Barack Obama said Tuesday of U.S. strategy. "We are in Afghanistan to prevent a cancer from once again spreading through that country," he said in a speech at West Point. "But this same cancer has also taken root in the border region of Pakistan. That is why we need a strategy that works on both sides of the border." The United States says Pakistan looms large because Taliban and al Qaeda militants operating in Afghanistan also have had a presence in Pakistan's northwestern region near the Afghan border and have threatened the governments and troops in both countries.